Physical vehicle security devices for vans come in many different forms, each providing different aspects of protection against theft from and damage to your vehicle. We are experienced installers of Slamlocks, Deadlocks and Lock protectors to virtually any make and model of van. The locks we fit are covered by a manufacturers’ guarantee, some of which have attained Thatcham approval, with the added benefit of a key registration service speeding up the time taken to obtain replacements should you lose a key. 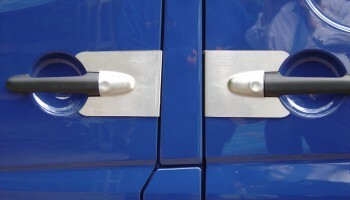 As the name implies a slamlock automatically locks and secures as the door is closed, without the van driver needing to physically lock the door. Then the van door can only be accessed by use of a legitimate key. Due to the automatic operation of a slam lock they are recommended for load area doors and are Ideal for multi-drop situations, such as courier/delivery services. The slamlocks we install are designed to replace the manufacturers’ vulnerable barrel and internal mechanism with high security vehicle specific lock, designed to resist attack and tampering. We are proud to have carried out slamlock installations on many vehicles belonging to major courier companies, helping them to protect their customers’ goods, and ultimately enabling them to provide assurance to their customers that their delivery is safe and secure. The installation of a deadlock prevents the door from being opened until the correct key is used. Even if access to the inside of the vehicle is gained through a window, the door will not unlock without the key. Consequently any thief who did get to your belongings, would have to remove them through the point at which they accessed the vehicle, i.e. the window. 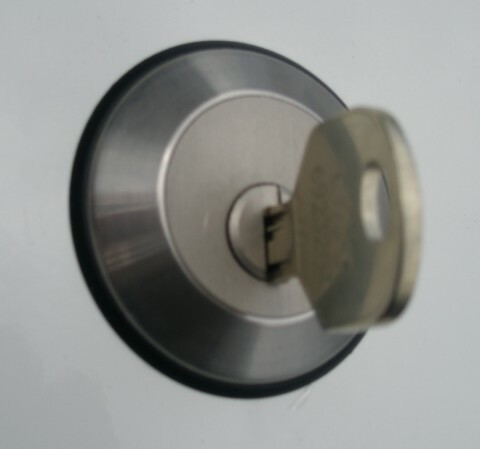 With van deadlock installation, quality is very important to us, so the Euro-deadlocks we fit are true deadlocks, meaning they have an internal mechanism which only ‘lifts’ when the correct key is being used to unlock the device, preventing the lock bolt being pushed back into the lock case. Cheaper ‘deadlocks‘ often rely solely on the actual key barrel to provide ‘deadlocking’, resulting in a much lower level of security. The ‘Armaplate Vehicle Lock Protection System’ has been designed to dramatically reduce damage to and theft from, light commercial vehicles. Armaplate is a unique and patented design which works by completely encasing the vulnerable area around the door lock and/or handle. On the outside is a tough, but aesthetically appealing stainless steel plate providing an incredibly tough barrier. This is further reinforced by another steel plate on the inside of the van door. With the actual doorskin, this forms a triple-barrier of steel between the thief and the contents of your van. Unlike with other devices such as hasp & staples, Armaplate installation provides an ultra-slim profile preventing it from being gripped and torn through the weak doorskin. It has no moving parts and will therefore never wear out or stop working. Its stainless steel construction means it will never rust or look untidy. No additional keys are necessary. It requires no action from the driver and will therefore always be doing its job.